Emerald Isle Video Slot Guide & Review - Casino Answers! Emerald Isle is a 5-reel, 20-line video slot developed by Cryptologic, featuring wild substitutes, scatter wins, a free spins feature and a bonus game. You can play Emerald Isle at VIP Casino and Casino Joy. 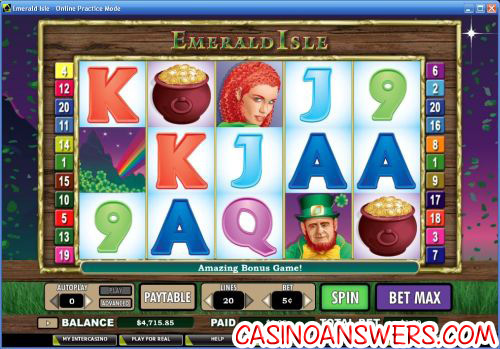 To play the Emerald Isle slot game, you must first set your bet per line. Your wagering options are $0.01, $0.02, $0.03, $0.04, $0.05, $0.10, $0.15, $0.20, $0.25, $0.50, $0.75, $1, $2, $3, $4 and $5. There are certainly enough bets for both casual players and high rollers to be happy. You can also modify the number of active paylines (up to 20). Once you’re ready to play Emerald Isle, you can use the “Spin” button to spin the reels with whatever settings the game is currently on or “Bet Max” to play all 20 paylines. If the game moves too slowly for you, there are three game speeds for you to choose from. When three or more Scattered Rainbow symbols appear from left to right, you will trigger the free games feature. You will win 10 free spins and a 3X multiplier. During the free games feature, all of your prizes will be tripled. The free games feature can be re-triggered. Free games are played at the lines and bet of the triggering spin. Free game wins are added to payline and scatter wins. The top jackpot on Emerald Isle is the Leprechaun symbol. Five Leprechaun symbols will win you 6000 coins. The Leprechaun symbol is also the wild symbol and will substitute for any symbol (except for the scatter symbol) to complete a winning combination. The autoplay feature can be accessed at the left of the game buttons. You can either set your number of autoplay spins from there or use the advanced options. You can choose the following spin conditions: number of spins (up to 999), number of paylines and bet per line. The stop conditions are: cumulative win of up to $5,000, cumulative loss of up to $5,000, single win of up to $5,000 or completion of the free games feature. Payouts are made according to the Paytable. Payline wins are multiplied by the credits staked per payline. Scatter wins are multiplied by the total bet. Scatter wins will be added to payline wins. Scatter wins are paid independent of paylines selected. All symbols pay left to right (reel 1-5) only in consecutive order, including the Scattered Rainbow symbol. Only the highest win on each selected payline is paid out. Coinciding wins on different paylines will be added. The Leprechaun symbol will substitute for all other symbols in the game (except for the Scattered Rainbow symbol). If you would like to visit the magical land of the Emerald Isle, all you have to do is sign up and make your deposit today at VIP Casino. When you do, they will give you a 100% signup bonus up to $225! Sign up today at VIP Casino! Are US players able to play the Emerald Isle slot machine for real money? Unfortunately, US players cannot sign up, deposit and play at Cryptologic online casinos for real money. For a US-friendly Irish-themed video slot, please read our Lucky Last Irish Video Slot Review. Does the Emerald Isle slot game have a progressive jackpot? You can find a 6,000 coin fixed top jackpot on Emerald Isle, but no progressive jackpot. If it’s a progressive jackpot you want, we will once again suggest you read our Lucky Last Slot Machine Review for an Irish-themed video slot with two progressive jackpots. 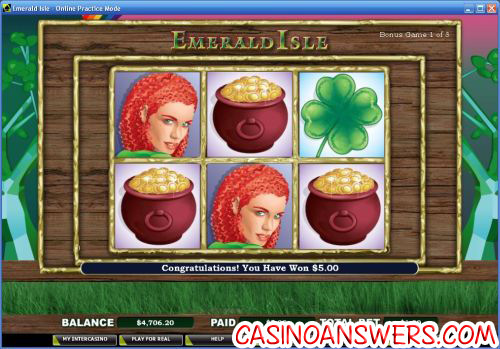 What special features can I find on the Emerald Isle casino game? Emerald Isle has a free spins feature with 10 free spins and a 3X multiplier (meaning your winnings are tripled) and a bonus game where you can win up to 100X your bet. What casinos have irish slots?